Meineke Car Care Centers' IT team at headquarters supports about 1,000 franchised retail shops across the US and five other countries. About 50% of locations use Meineke's custom POS system to handle customer transactions, which the IT team supports. In the beginning, to provide support for its POS system, the IT team was primarily using the telephone, talking users through support issues. As a result, a typical support incident could take an average of 40 minutes to resolve. 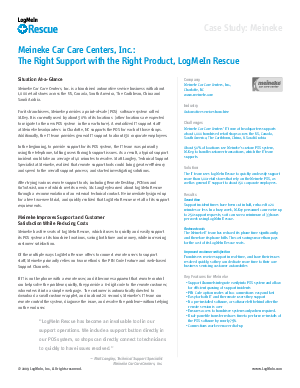 This Case Study shares how Meineke decision to use the LogMeIn Rescue remote support solution now allows them to quickly and easily support its POS system at its franchise locations, saving both time and money, while increasing customer satisfaction.